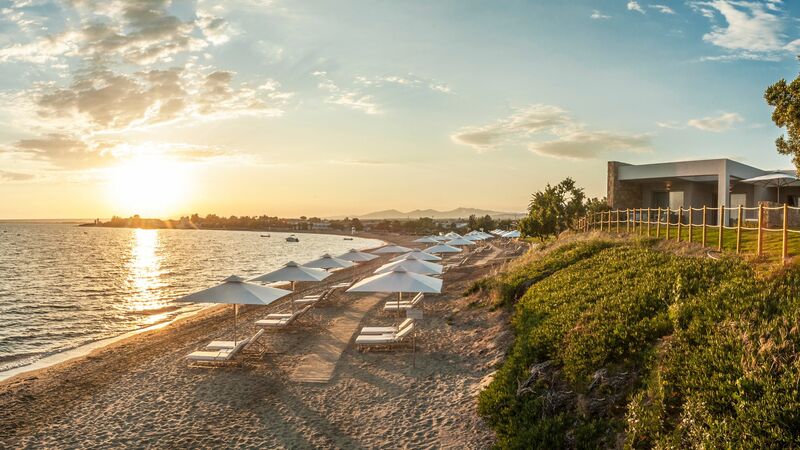 Ikos Olivia is set on its own white sandy beach on the idyllic Halkidiki peninsula, close to the traditional Greek village of Gerakini. 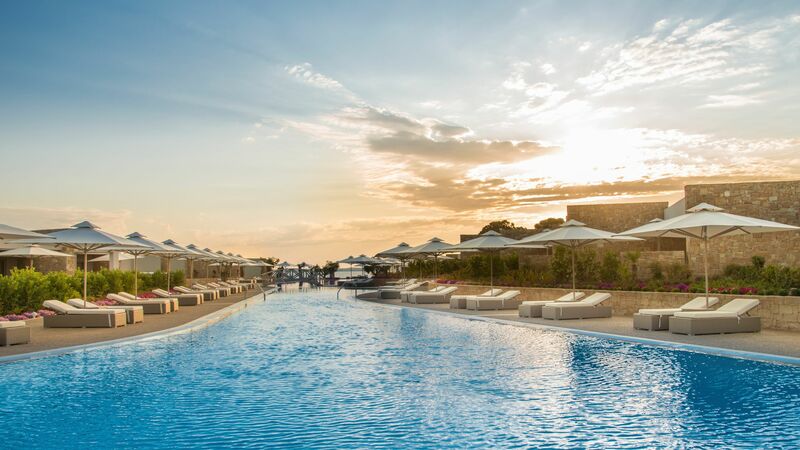 Surrounded by 22-acres of stunning, landscaped gardens with olive trees, the resort has 142 rooms and four pools including a lagoon style pool with a swim up bar. There’s something for all the family to enjoy, with a children’s club and crèche, plus a football academy. 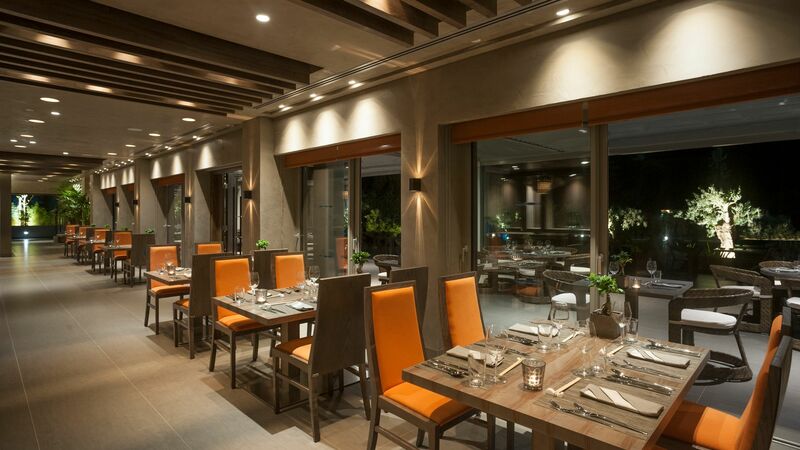 Dine in one of Ikos Olivia’s five restaurants, which offer everything from French Michelin-starred menus to Mediterranean buffets. Guests aged 16+ can indulge in a pampering session at the Anne Semonin Spa and there are sports to suit the whole family, including beach volleyball, tennis and aqua aerobics. 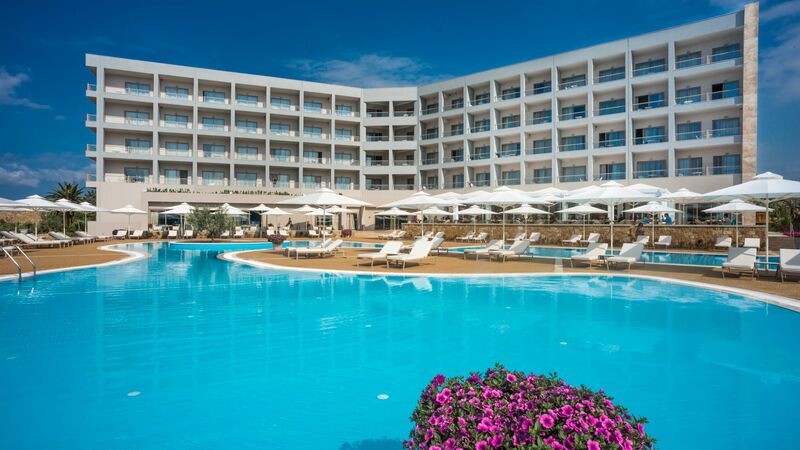 Ikos Olivia was voted the number one all inclusive resort in the world in the 2018 TripAdvisor Travellers’ Choice Awards. Guests who opt for the all-inclusive Infinite Lifestyle™ package have access to deluxe accommodation and room service, plus activities and entertainment. Have breakfast, lunch and dinner in Flavors restaurant or try dining at the resort’s à la carte restaurants. Child prices apply for two-to-11-year-olds. 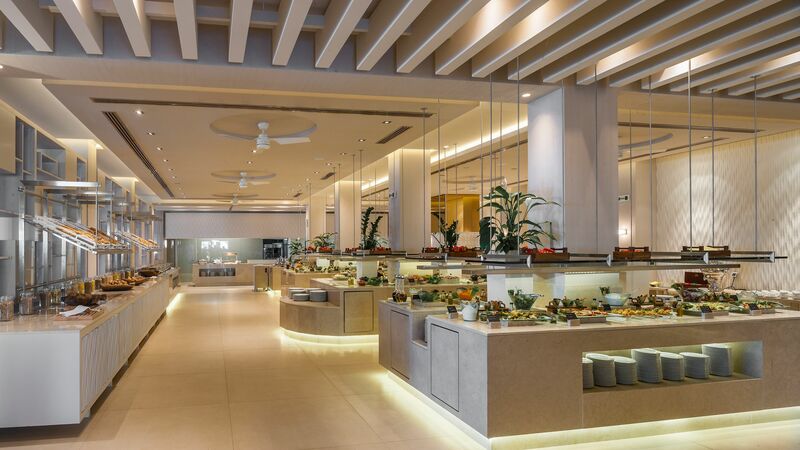 Infinite Lifestyle&trade – Breakfast, lunch and dinner in Flavors main themed buffet restaurant. Dinner is also available in the à la carte restaurants – Ouzo (Greek), Fresco (Italian), Anaya (Asian) and Provence (French Provençal) (subject to availability–reservations required) plus a dine out service using 3 designated local restaurants. Beach and pool food and drinks service. Midday snacks, afternoon coffee, sweets and ice cream, non-alcoholic and branded alcoholic drinks between 10:00–02:00, 24-hour room service, fully stocked mini bar, table tennis, darts, live shows, aqua aerobics, board games, DVD library, beach volley ball, tennis court, mountain bikes (once per stay–reservation required), and non-motorised watersports (once per stay–reservation required). Use of indoor pool, steam, sauna, and fitness centre (ages 16 years and above). Anaya serves tasty Asian cuisine, with dishes inspired by China, Thailand and India. There’s an à la carte menu with al fresco dining on the balcony and beautiful sea views. Reservations are required. Guests are not permitted to wear shorts and flip flops. Dine on the beachfront at Ouzo, which serves breakfast, lunch, dinner and snacks. In the evening, there’s a delicious à la carte menu designed by Michelin-starred chef Lefteris Lazarou; featuring a blend of classic Greek dishes with Mediterranean flair. Come to Provence for authentic French food. Choose from an à la carte menu of traditional dishes, as well as a quiet zone for romantic meals. 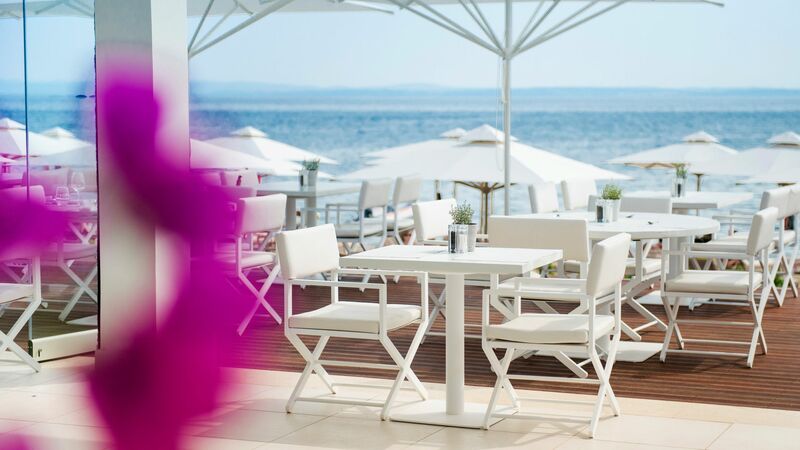 Flavors is Ikos Olivia’s main buffet restaurant, which enjoys sweeping sea views and a quiet zone. The buffet boasts an extensive variety of Mediterranean food and there’s a great wine list. Guests are not permitted to wear shorts and flip flops. 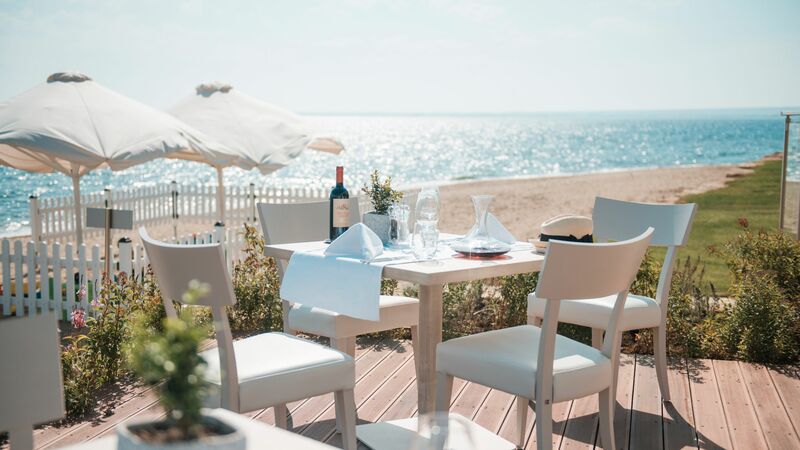 Head to the beach to dine on Italian food overlooking the Aegean Sea. Fresco has an à la carte menu created by Michelin-starred chef Ettore Botrini and features fine meats, seafood and fresh market produce. Take a break from swimming and sunbathing with a refreshing drink at the Aqua Pool Bar. Located next to the main swimming pool, it serves a range of drinks throughout the day. Indigo is the main bar at Ikos Olivia and the perfect place to relax with a drink throughout the day. Almyra is set down by the beach and is the ideal place for evening cocktails. The menu also boasts a range of beers, wines, spirits and soft drinks. This lounge is specially for Deluxe Collection guests, offering an elegant, peaceful ambience. Sip on pre-or-post-meal drinks at the Lounge Bar. Ikos Olivia’s Teatro Theatre Bar has a full drinks list, including branded international and local spirits. The resort’s 450-metre stretch of white sand beach is just steps from the hotel. Order snacks and drinks to be delivered to your sunbed and cool off in the calm, clear water. For ultimate relaxation, there’s an adult-only area and a 'babewatch service', where trained childcare staff will look after your little ones while you kick back. This service is free for the first 30 minutes. Ikos Olivia has four beautiful swimming pools to choose from. The main attraction is the lagoon-style outdoor pool, which has a swim-up bar and is surrounded by sun loungers with parasols. There’s also a 450-metre squared heated pool and a separate children’s area. 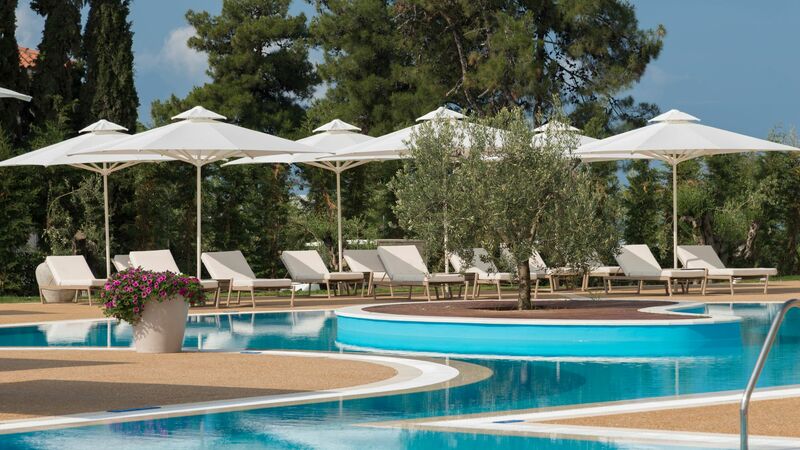 Deluxe Collection guests have exclusive access to a huge heated pool and there’s an additional pool at the Ikos Spa. 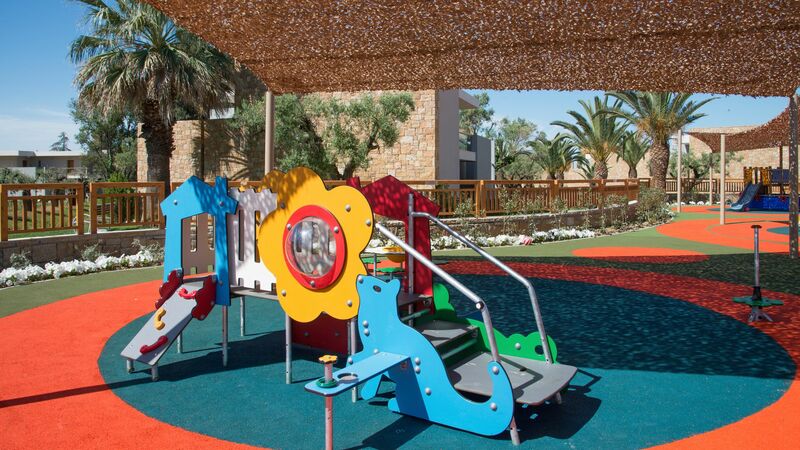 The crèche and all kids’ clubs at Ikos Olivia are run by qualified childcare specialists from the Ofsted-accredited UK organisation, Worldwide Kids. Take a break while staff care for your youngsters and provide entertainment including stories, songs and games. Children can enjoy a full programme of indoor and outdoor activities, including arts and crafts, sports, swimming and games. 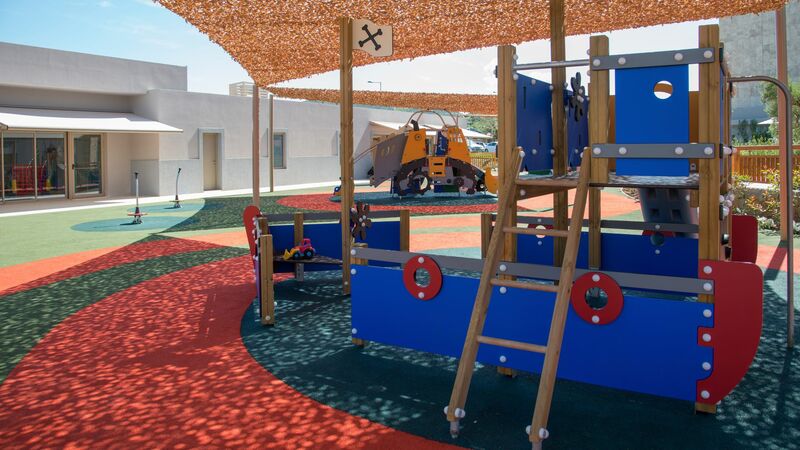 There are also outdoor play facilities such as a playground and mini tennis courts, as well as the kids’ pool. Teenagers can stay busy with a variety of team games and sports tournaments, from basketball to beach volleyball. There are also cooking classes, water sports and evening entertainment. Football-mad kids will love the WK football academy at Ikos Olivia, which is run by football coaches and available at an extra charge. 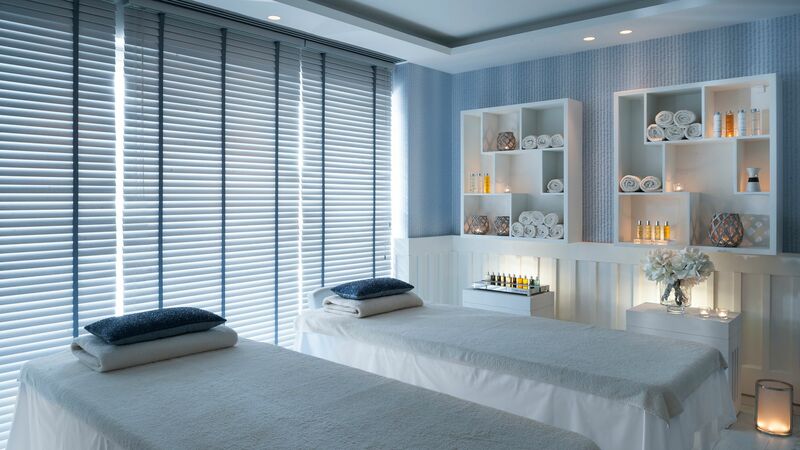 Indulge yourself at the Ikos spa, which has a heated pool, hammam and sauna, steam bath, relaxation area and fitness studio. Indulge yourself with a lavish treatment from the renowned French beauty brand. You can also book treatments at the onsite hairdressers and nail salon. The spa is for guests aged 16 and over. Sports facilities include two floodlit tennis courts, a cardio training room and football academy. There are also mountain bikes and guests can take part in beach volleyball, basketball and classes such as Pilates and aqua aerobics. There’s a variety of water sports on offer at the beach, including windsurfing and snorkelling, canoeing and water polo. Guests can even take an introductory diving lesson at the resort pool. 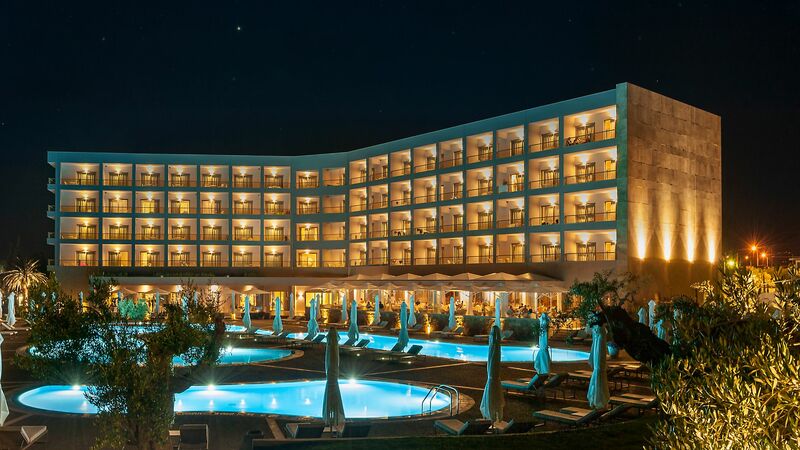 Evening entertainment at the Ikos Olivia includes live shows, dancing, movies, and beach parties. Located in Sithonia, in Halkidiki on mainland Greece, Ikos Olivia is ideally located for those wanting to enjoy a tranquil holiday. 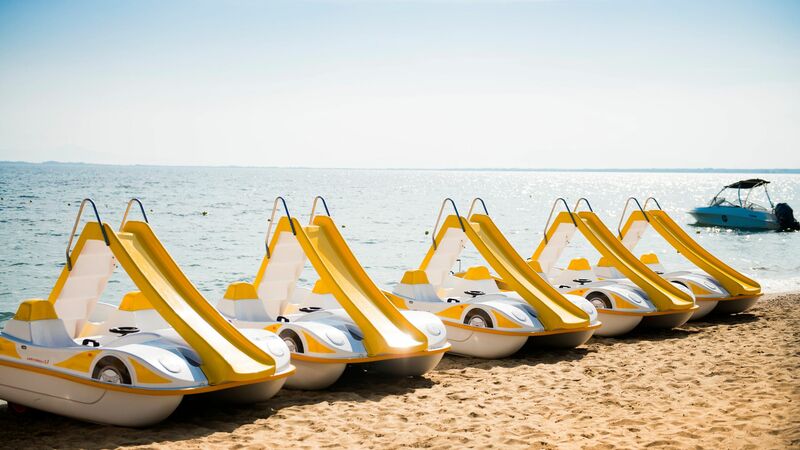 It’s right on the golden sands of the beach, where you can spend days soaking up the sun or try some of the water sports available. Sithonia is the middle of Halkidiki’s three peninsulas and has beautiful natural landscapes. Pine forests lead down to the rugged beaches which are lapped by crystal clear waters. Spend your days exploring the little fishing villages, with their whitewashed architecture and excellent local restaurants. Or you could walk along the coast before finding your own secluded spot. 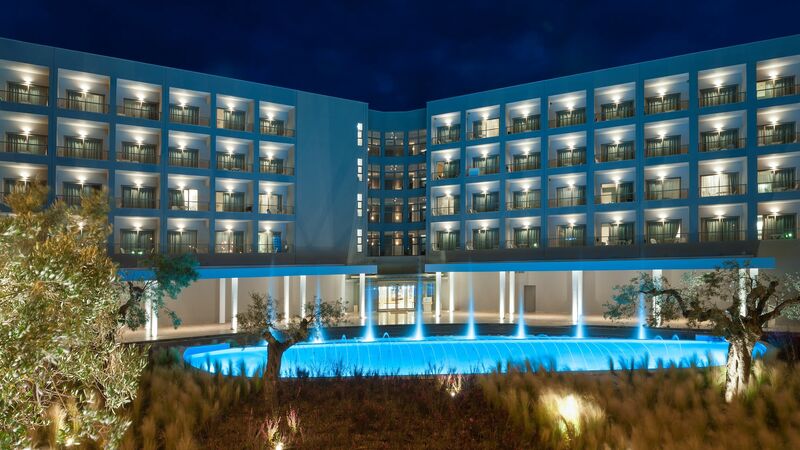 Ikos Olivia is an hour’s drive away from Thessaloniki Airport. Contemporary design with a range of modern facilities, these rooms offer an inland view. Contemporary design with a range of modern facilities, these rooms offer a sea view. Superior Double Rooms are contemporary in design with a range of modern facilities including a smart TV and Nespresso® coffee machine. They feature a balcony and an inland view. Superior Double Rooms offer contemporary design with modern amenities, these stylish rooms are ideal for a comfortable stay at the Ikos Olivia. Enjoy sea views form your balcony, or head indoors to take advantage of the smart TV and coffee machine. Double Bungalows have a balcony if located on the upper floor or a private garden if located on the ground floor with views of the garden. Rooms have a double bedroom with ensuite bathroom and amenities include air conditioning, bathrobes, safe, hairdryer and tea and coffee making facilities. Panorama Junior Suites offer magnificent panoramic sea views and a comfortable seating area. Suites have a double bedroom with ensuite bathroom with shower and amenities include air conditioning, bathrobes, safe, hairdryer and tea and coffee making facilities. One Bedroom Bungalow Suites are spacious and well equipped with a separate bedroom and lounge. These rooms have a balcony with sunloungers and a garden view and are located on the upper floor. Suites have a double bedroom with ensuite bathroom and amenities include air conditioning, bathrobes, safe, hairdryer and tea and coffee making facilities. One Bedroom Bungalow Suites are spacious and well equipped accommodation with a separate bedroom and lounge. These rooms are located on the ground floor and have a private garden with a garden view. Rooms have a double bedroom with ensuite bathroom and amenities include air conditioning, bathrobes, safe, hairdryer and tea and coffee making facilities. One Bedroom Bungalow Suites are spacious and well equipped with a separate bedroom and lounge. These rooms are located on either the ground or upper floors and have a balcony or garden with a sea view. Rooms have a double bedroom with ensuite bathroom and amenities include air conditioning, bathrobes, safe, hairdryer and tea and coffee making facilities. The brand new Two Bedroom Bungalow Suites Beach Front are set in a prime beach front location, only steps away from the sandy beach, offering magnificent views of the Aegean sea. Ideal for larger families, the suites are located either on ground level with private garden or on the first floor with balcony. Spacious and well equipped with a separate bedroom and lounge. These rooms are located on the ground floor and have a private garden and a pool view. Guests in deluxe rooms enjoy the benefits of the Ikos Deluxe Collection which include; exclusive check in & check out, butler service, two complimentary neck & back massages per room per stay (16+ years), exclusive use of the Deluxe Collection swimming pool and private section on the beach, upgraded beach and pool service, one special dinner on the beach, bottle of Champagne upon arrival, upgraded mini bar, premium bathroom amenities, upgraded room service menu and a pillow menu. The One Bedroom Bungalow Suites are stylish in design and offer a private pool and a garden view. Suites have a separate bedroom, bathroom and living room with amenities including air conditioning, bathrobes, safe, hairdryer and tea and coffee making facilities. A very spacious suite featuring two separate bedrooms and a lounge, ideal for families. These suites are located on the ground floor and have a private garden and a garden view. The Deluxe Two Bedroom Bungalow Suites offer a private pool and garden view, perfect for relaxing with the family in your own space. The suite also has a separate bathroom and shower room with a rain shower. A stylish and roomy suite featuring two separate bedrooms and a lounge, ideal for families. These suites are located on the beach front with a private garden. Save up to 30% discount on the hotel price for holidays between 23 - 27 October 2019. Save up to 20% discount on the hotel price for holidays between 05 - 15 October 2019. Save up to 10% discount on the hotel price for holidays between 22 April - 12 May 2019 & 31 May - 17 June 2019 & 27 June - 07 July 2019 & 16 - 22 October 2019. Save up to 10% discount on the hotel price for holidays between 21 July - 01 August 2019 & 26 August - 15 September 2019 when staying in a Panorama Junior Suite Sea View or a One Bedroom Bungalow Suite Private Garden with Garden View. Honeymoon couples travelling until 27 October 2019 receive a romantic candlelight dinner, sparkling wine on arrival and a farewell gift. A minimum 5 night’s stay is required for the above offers and a wedding certificate is to be presented at check in. A minimum of 5 nights stay is required for the above offers. We spend a wonderful week in Ikos Olivia ,everything was in order ,the warm welcoming ,the immediate check in. The room was splendid but the biggest surprise came from the "ouzo" restaurant ,the menu was spectacular, everyone were warm, polite and professionals , we really felt cozy like home. Many thanks to all personnel of this restaurant !!! Easily one of the best resorts I have been too. Restaurants were amazing and so was the resort itself plenty to do with kids on the resort. Staff were excellent and couldnt do more. Loved the gym and spa area also. “ Excellent stay - Liza the Front house Manager made it extra special!